Point Loma Seafood’s is famous all over, not just in San Diego. Thirty years ago I was a principal in Mohave Valley, Arizona and had two delightful, single teachers that taught for me – Bill and Cher. They subsequently married, and in the past 30 years I have seen them twice, until yesterday. 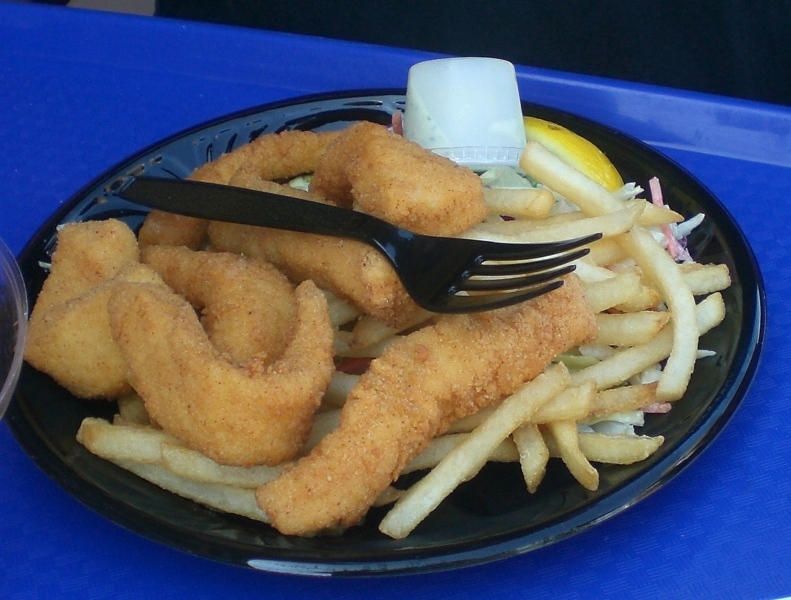 Both Cher and Bill ordered the Calamari plate – nice strips of fried calamari, served with French fries and coleslaw. They said it was delicious and always order it when they are here. The cost was $11.13 per plate. Since we were eating at 2:30pm, I elected just to have their Ceviche cocktail for $5.10. Although I make a killer Ceviche, theirs is almost as good. Cher and I each had ice tea – $2.32 per glass – and Bill had a 40 oz glass of draft beer – $4.45. The total bill was $42. The menu is quite extensive and is available on line. Their fresh fish to take home is extensive, and not only do they have fresh fish, they have smoked fish that they have smoked themselves; all kinds of shell fish – some in the shell and some already shucked. There is fresh sushi, live lobsters, etc. The restaurant was remodeled a short time ago, and although I do not have a comparison of what it was before, it seems to me that their prices are slightly higher now. That is no surprise. However, do not go there expecting to have an inexpensive meal, because it will not be. Don’t expect to be able to buy their fresh fish and not pay a substantial amount for it. It is not cheap, but it is so fresh and tasty. The view is delightful – from on the patio outside the restaurant to the newly added top floor overlooking the fishing landing. Even at 2:00pm yesterday there were people lined up to order; lined up to get a table; and when we left at 4:00pm it was still busy and crowded. Judi’s friends: Bill and Cher. Point Loma Seafood has always been a winner. And it continues to be. Overrated. Breaded and fried everything, so the place feels more like a tourist trap than anything else. You’d think by now PLS would have charbroiled/ grilled options for the younger, health-conscious set—nope! It’s ‘H.Salt Fish&Chips’ with service and expensive alcoholic beverages. 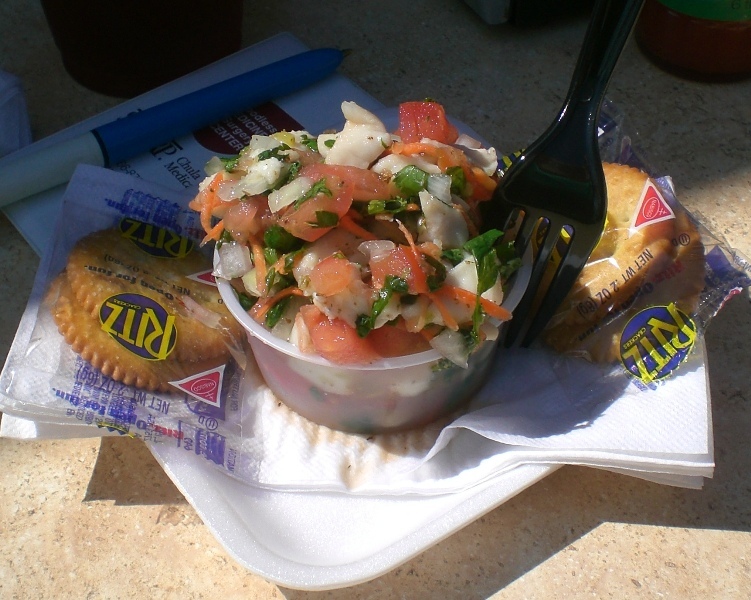 Unlike my friends, I had a Ceviche cocktail – fresh fish without any breading. BUT….Mercy posted the following on my Facebook: “Next time try Mitch’s Seafood, same parking lot behind Pt. Loma Sport fishing. Once you do, you won’t ever go back to Pt. 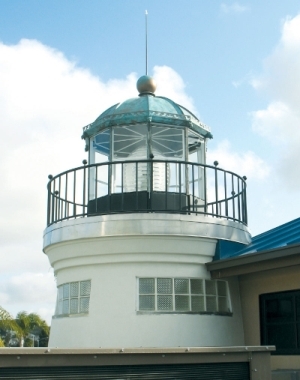 Loma Seafood!” I have never tried Mitch’s – can’t even visualize where it is, but I will try it soon. Do you know anything about it? While I like PLS, in all honesty I like Mitch’s a little better also. It’s actually spitting distance just south of PLS. You’ve probably seen it without even realizing it. While they lots of fried stuff they use a (in my opinion) a tastier beer batter. And they DO have grilled fish sandwiches. Heres the link. obecean, I couldn’t agree more. I did let Judi know a few days ago that there is a much better choice in the same parking lot, but hidden from plain view, and I really DON’T want a lot of peeps to know about it, Mitch’s Seafoods. It’s behind Point Loma Sport Fishing Store. Sure they have a few fried choices, but most are grilled and their fish stew is OUT of this world at only $15. As good as any Ciopinno I’ve paid upwards of $28 for! Taco Tuesdays it gets crowded after 5 pm. One of the largest and not overly breaded crab cake sandwiches I’ve ever had. They have the fresh catches of the day up on a board and you just choose the way you would like it cooked. I’m not saying their fish platters are inexpensive, but for the price range of $13-16, they are the bomb and worth it! And here is what I REALLY don’t want people to know….probably the best clam chowder I have ever had and I am extremely picky about my chowder. Must have a lot of clams, not a lot of potatoes, great flavor and not too thick and certainly not too thin. This place gets the award for perfect chowder. I told Judi, once she goes here, she probably won’t be back to PLS, which I also feel is a tourist attraction…good, let it be and NOT Mitch’s! Thanks Mercy – will definitely have to check Mitch’s out. Clam chowder is good too. Thanks for the link. Hope to get this this week! Is the parking in the PLS lot – or in the Sport Fishing lot? I believe you can park in either. Sometimes we end up parking on the street. HA HA Judi, we posted at the same time!! I was just getting ready to tell you that!!! Like minds…. Say what you will about the fried food, but the squaw candy from the smoked fish section is an amazing treat! It’s always nice to have real crabmeat in sushi as well. Mitch’s used to be a well kept secret but apparently the word is out. I have been going their for well over 16 years. PLS is for tourist. Try the new place on Newport right under Ace tatto…EXCELLENT fish soup and fish sandwiches !!! comparable to Mitch’s but with out the fantastic view…. Wow Jim, I had no idea Mitch’s had been there 16 yrs! And you beat me to the new place in OB, just went there yesterday, and whilst it’s still no Mitch’s, it’s seafood is fresh, and I’m thrilled to have it so close to home. Newport Avenue Yacht Club is kind of a funny name, but it works. I had a fresh snapper taco and a small cup of their cioppino. Nothing is gonna beat Mitch’s cioppino for me, but this will do in a pinch. Taco was great and you can get their fish with any number of marinades on them, I got the garlic butter, yumm. They also have salads, sandwiches, and so far, no fried food, but they said they’re going to add it. Cash only right now, credit cards coming. This place is owned by John, who owns Harry’s Coffee Shop and Oscar’s Mexican Seafood, both in La Jolla, and they get excellent reviews. Also not sure if you know, that this new place is the ONLY place in OB to serve FRESH seafood! Never been a fan of South Beach’s frozen fish taco with way too much dressing and cabbage on them. And the NAYC is right across the street! It is very welcomed here in OB! Interesting, Jim and Mercy. Ate at Mitch’s last night and they told me it has only been Mitch’s for about 5 years. I remember when Bob and I used to go fishing out of the Pt. Loma Landing we ate at a restaurant that must have been what is now Mitch’s. Monica thought the waitress said that there was a change of management – but we both heard “five” years. Never ate so much fish in my life – will have to try the Newport Yacht Club this week too! I was trying not to confuse anyone , Hudson Bay Seafood was the prior name and they had excellent food as well 18 years ago or so. When new ownership came in they changed the name and we continued to frequent the place. 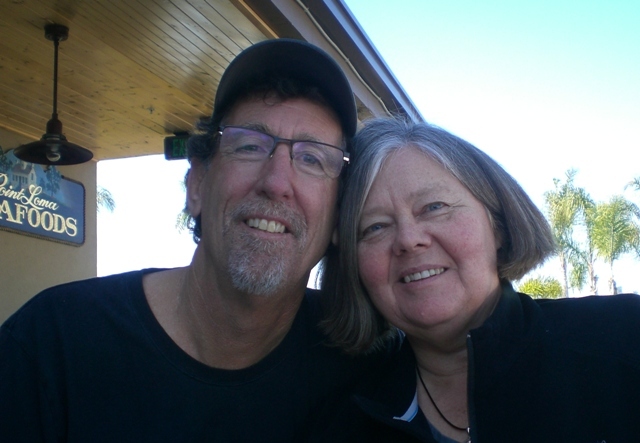 I would go to Mitch’s any day before going to PLS…….Mitch’s is one of the better kept secrets in Point Loma, until now. Thanks, Jim. I thought it was the Hudson Bay but wasn’t sure. Going to try the new one on Newport tonight.